Re: Not a normal Day. Chandra let go and started running up the street, waving back to Tulip to follow her quickly. She navigated from where they were to the main street and followed the road that eventually lead to the clock tower. She would periodically stop to wait for Tulip if she fell behind, but Chandra stopped completely at the bridge, looking around for something. Tulip's reaction to her sudden bolt of speed was lacluster, but at the very least, she could catch up. Tulip dared towards her, getting past Chandra's 'periodic points' and then arrived at the bridge. She seemed terriby confused. "What business do we have at the bridge? I have little to no idea." Chandra put a hand over her mouth as she continued searching. After a few moments, she turned back to Tulip and gestured for her to stay where she was before spreading her wings and taking off a few feet off the ground and darted towards the side of the huge clock tower which she disappeared to for a few moments before the ground subtly shook. From the side of the clock tower walked out a 12-foot giant with a large ax resting on his shoulders. He was heavily armored, and had a tail which was also armored fully with chain mail and steel plating. Sitting upon his other shoulder was Chandra, who was waving at Tulip happily. Tulip did not object to Chandra closing her mouth, it was just temporary, and it wouldn'the even last long, thoughard really, she was just doing it to giveveryone her silence and space-two things Tulip herself appreciated. When the giant came out...she did not take it well. Tulip quickly retrieved the heart necklace and tapped it thrice, unveiling it to be a scythe. She then raised it menacingly at the giant, obviously enraged. Then, after noticing the wave, Tulip dropped the scythe but she still had her wand in hand, preparing for a spell. The angel hopped off from Wolfram's shoulder and softly landed in front of Tulip, tugging on her sleeve again, eagerly. Once she got Tulip's attention, Chandra would point to the dropped scythe, then make an outline of a necklace around her neck, and then pointed to Wolfram's ax. She was trying to ask if she knew how to make the ax like the scythe, the way it could be transformed into a necklace to be carried around more easily. Meanwhile Wolfram was following where Chandra was pointing to get an idea why he was called out here. There didn't look to be any problems that he could help with. Tulip dropped the scythe, then pointed to where she was tugging and tried to realize the apparent message. Hm. She must want me to make that-that poor, little giant's-axe enchanted, like the necklace. "You want me to enchant the axe, right? At least I think that's it. Also...hi, big guy." Tulip winced. Chandra nodded, beaming a hopeful smile that she could do it. Wolfram was still confused on the matter. Enchant his ax? Did this woman know how to do something like that? The giant knelt down to one knee to make communication a little easier. "Hello. Are you a friend of Chandra?" he asked, his deep voice having a little echo due to his helm. Tulip stepped back slowly, before taking a deep breath when the gisn't approached her to talk to her. She put away her wand, hopefully to not aggregate the large giant. "Hello there! As you might have guessed, I am an acquaintance of Chandra. And who might you be, if I may ask of you?" She tugged at his axe. Chandra crouched down to examine the scythe on the ground, curious if she could tell what kind of magic was used to make a necklace turn into a scythe. She silently wondered if she would be able to do something like that. "My name is Wolfram, and I am Chandra's guardian," he said, glancing at the angel once before turning back to their new acquaintance. "And who might you be?" TulI stares up at the giant, clearly uncomfortable. She'doesn't been warNed not tonly give out informat ion recklessly, but if she was Chandra'so guardian, he couldn't be SO bad. "My name is Tulip. Tulip Aeridale, owner-mostly-of the impressive scythe that Chandra is inspecting. I met the angel on my way to school, then she became interested in the transforming Scythe." Tulip then sidestepped behind Wolfram and approached Chandra. "Did you know it also can't be held by evil and protects you from becoming such?" Chandra looked up at Tulip intently. Was she a holy knight or something? Did she fight evil? Could she secretly be an angel too? Or at least a half angel? Or was she like Wolfram? "School? Well I'm sorry she dragged you so far out here. I can can give you a ride if you'd like." Tulip smiled then laughed, nervously stepping back as she did so. She herself wondered how Chandra had come across a giant, especially considering how the large armored giant was her personal-and presumed-only guardian. It's a weird world, isn't it? "Well, to be honest, I don't really need a ride back to school at this point. I mean, I could simply teleport there, and if I explain to Diana-my 'mother'-she might understand." Wolfram nodded and stood back up. "In that case, then you should go. I imagine you are already late today. Sorry for the trouble Chandra has caused you." He wasn't trying to be mean in any way, but he knew it would be bad if Tulip was scolded for being late. But Chandra once again tugged in Tulip's sleeve and pointed to the ax. "I'm sure whatever enchantment you had in mind can wait until a later time." Tulip did not turn back and look away, like the giant would have expected. Instead, she took the axe. Apparently, Tulip was determined to enchant Wolfram's weapon before heading back to school. It's the least I could do, after bothering Chandra. "Don't you worry too much, iron giant. Sure, I'might su per late. Well, I can just...use magic and get there! I know I'm not supposed to but..." Tulip smiled normally. Wolfram thought about it for a moment, but he didn't let go of his ax, since he doubted Tulip could carry the weight of it. Chandra was nodding, and he knew that she brought this girl to him for a reason. "Very well." The giant set the ax gently on the ground. It was almost as tall as he was, so one could imagine how difficult it is for a regular person to even lift one end of it. "My only request is that you don't break it. Finding a replacement will be difficult." Tulip nodied, making sure to keep what the gisn't said in her mind. Tulip then tried to lift it but failed horribly, straining her hand in the process. She still was determined to enchant this object. "What do you want it to be transfotmed into? Also, what other special effects must it have? Got to know the details. " Chandra hopped in place for a moment and then flew up to Wolfram to whisper in his ear, cupping her hands around her mouth to make sure only the giant could hear her voice. "That would be perfect." Wolfram looked back down at Tulip. "Chandra suggested a glove or a gauntlet. A pair if possible, and keep in mind that I only have 4 digits on my hands. As for additional effects... Can you make it better at conducting magic?" Tulip almost nodded but then jumped up at the fact that Chandra, the seemingly mute angel, cold actually talk prrfectly. Or is it that she just didn't speak English? Or that she preferred not to talk to strangers? That should be it. "Better in conducting magic? I'll try, though better in helping the user in resisting magic would be easier for me. But sure. Er...no payment needed, in case you were wondering." Chandra went back down to watch Tulip work her magic. Wolfram was still worried if this had any adverse effects on his weapon, but he didn't want to waste Chandra or Tulip's time for nothing. He has been needing an upgrade of his equipment for a while now. Its not like anyone was making anything his size. Tulip went to work and then, after muttering what seemed to be a spell, reached into her bag and brought out a four-fingered gauntlet. She then began to try and raise it against a wall, but was very unsuccessful in doing so. "Mind helping me out a bit? Also, you are welcome. You guys seen like nice people." Wolfram crouched and leaned in to help as requested. Both Chandra and Wolfram were impressed that Tulip had conjured up the gauntlet from her backpack. Either she had the power to simply create anything she wants, or she had that item already in her bag. If the latter were true, then that would have truly been impressive. "We try to help when we can." She smiled and then stood up and bring out another charm. It was in a heart shape. She attached it to the axe and then brought out another one, this time, slapping it unto the gauntlet. Both of the hart crystals disappeared nearly instantly. Just by watching, Wolfram had gained a rather good hunch on how all this worked. The charms she used would bind the items and either have each act as a state of existence, or merge the items and create the transformations. But there was something he was meaning to ask. "Will the gauntlets retain the ax' original properties?" Tulip stopped what she was doing and then looked at the giant before nodding hastily. "You are very correct. 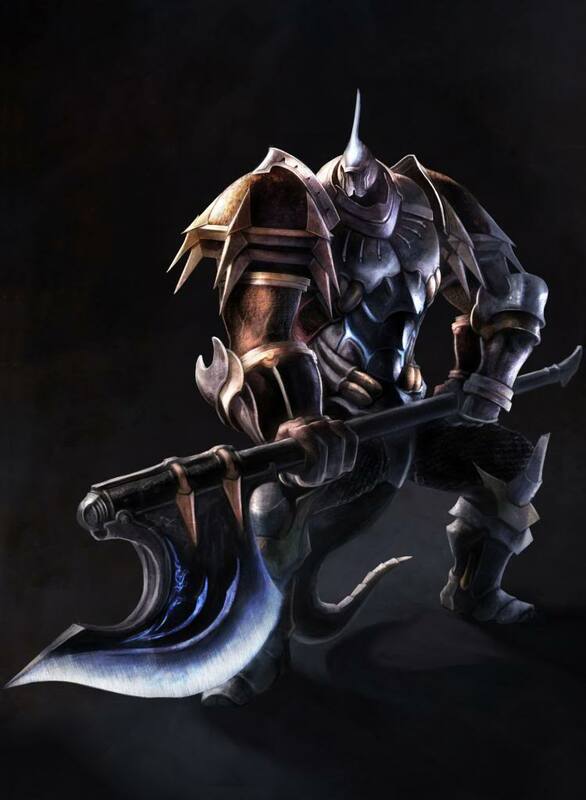 The axe will retain it's current physical and magical properties, except it will be able to generate more magic." The axe and gautlet began to glow.